Exclusive £5 Gift Card with Orders Over £50 at Dunelm Pick a free £5 digital gift card once your Dunelm purchase of over £50 has been verified! Simply wait for your email from us on how to claim. 20% Off Selected Dining & Branded Pots and Pans at Dunelm Including sauce pan sets and Tefal frying pans, head over to Dunelm to take advantage of this amazing discount. 50% Off Selected Children's Bedding, Toys, Car Seats and More at Dunelm Shop the Dunelm end of season sale now for 50% off selected kids duvets, cushions and accessories. Free Delivery on Orders Over £49 at Dunelm Spend £49 or more at Dunelm and bag yourself free delivery! Rugs from £25 at Dunelm- New In For Spring! Time to refresh your home for spring? Shop Dunelm now for new spring ready styles. Made to Order Sofas from £549 at Dunelm Get your sofa exactly how you wanted it with made to order at Dunelm. Dunelm is the shop of choice for quality and affordable home accessories. The online store is curated to offer everyone the chance to renovate their home, with endless possibilities for every style and taste. When it comes to making your home your own, Dunelm knows exactly where to start. 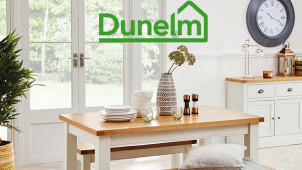 Explore the online store to begin refreshing your home, with Dunelm you'll get great prices that'll make home improvements even more affordable. Shop in-store, online, download the Dunelm app or pick up a catalogue and choose the items that could make your dream home come to life! Now you can start living, when you can find happiness and comfort in your home interiors. Dunelm makes it easy to turn your house into a home, and it never ceases to inspire its 100s of customers. Whether you're into rustic, country living or if you prefer a more modern and pristine look to your furniture and accessories - you will find what you and your family needs at Dunelm. How do I use my Dunelm voucher code? Select a delivery option and continue with the ordering process by choosing a store for collection or entering your delivery address before continuing to complete the transaction. Sign up to the Dunelm newsletter to get money saving deals and information about new products sent straight to your inbox. Yes, should you change your mind on your goods you can return your goods for an exchange or refund within 28 days of receiving them. Do ensure that you have kept your receipt and please read here for more information. Does Dunelm do student discount? You can find all of your student essentials for living at Dunelm; although there isn't currently a student discount in place, you can always count on a good deal when you visit through vouchercloud. Does Dunelm offer free delivery? With orders over £49 you can qualify for free delivery, otherwise, you can reserve & collect your order for free from over 150 stores nationwide, with goods being available in as little as 3 hours! Standard delivery is £3.95 and takes 3-5 working days. There is free delivery for orders of and above £49. With free Reserve & Collect and Express Delivery for £5.95 available too - see here for more details. If you change your mind about something you've bought from Dunelm, you have 28 days after you purchased the item to return it to Dunelm for an exchange or refund. Unwanted items will only be accepted for return if they are unused and in their original condition. Dunelm can either refund you, provide a credit note, or exchange the item for you, do check the Returns policy here. Call 0345 165 6565 anytime Monday to Friday between 8am - 7pm or 9am - 5pm on weekends. Alternatively you can fill in the contact form. Dunelm began life in the UK as a family-run textile company. Sticking with low prices and high value, Dunelm has become the go-to homeware store for many. Shop with a Dunelm voucher code and discover the affordable way to make your home shine from the inside out. With something for every room, from curtains, bedding and bathroom products to cushions and furniture pieces - this is home happiness made affordable. Before you invest in a personalised sofa or armchair from Dunelm, confirm your fabric choices by ordering free swatch samples. Then, you can narrow down your choices and finalise your design before placing your order. Find hundreds of samples, from Gia Slate to Harbour Quartz - there will be a colour and texture to suit your personal and interior design style. Don’t be afraid to explore the options with Dunelm! We like our sleep at vouchercloud, so curtains and blinds are key products in our homes! Browse through lovely Readymade curtains as well as Made to Measure options too, because when you're saving with your Dunelm discount code, you're allowed to update yours for the season! Shop by colour scheme or try something new, then go Cordless, Roman, Blackout or another type to pull the room together seamlessly. Functional and stylish - this is a real treat for you and your windows.